Are You Nickel and Diming? This video was shown at my son's high school to demonstrate to the student body that everyone has unique talent and that anything is possible. Here are a few video's that will blow you away. If you are thinking of renaming your company it is worth reading. The impact this can have on the industry is to make 400 DPI devices obsolete for many uses. As architects embed more photographs, and create more detailed drawings the demand for high resolution printing increases. There is another interesting phenomenon here. Architects and engineers have been placing low volume 600 DPI devices in their locations and are becoming accustomed to the quality they get from these devices. It will be hard for them to accept a lower quality print for production distribution. We have seen this phenomenon in the past with the Oce 9800. If you had multiple black and white TV's in your house and you bought one color TV, how long was it before the other black and white TV's were replaced. One reprographer told me I do not want to put a 600 DPI device in my production operation because my customers will like the quality so much I will have to replace all of my equipment with 600 DPI devices. This will work if (1) your competition does not adopt 600 DPI, and (2) your customers do not have 600 DPI devices in their offices. I believe both of these are unlikely. This doesn't necessarily mean you must get rid of your 400 DPI devices. As we all know, the contractors do not care if it is 600 DPI or 400 DPI, but this would mean you need a workflow to separate contractors work from architects. After struggling to find a special screw for 45 minutes at Home Depot and getting very little help from their "knowledgable staff" I saw this upon exiting the store. 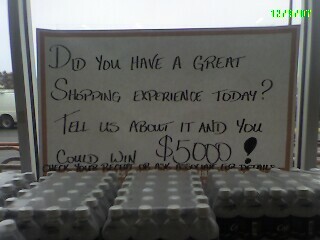 Hey for a chance to win $5,000 I will have to rethink my experience. Is the management trying to measure the customer experience? KIP caught the markets attention two years ago when they showed the Color 80 at the IRgA show in Orlando. Many are wondering what happened to it. The word is that it is around the corner. You can be rest assured that other wide format vendors are not sitting idle. I have heard some reprographers predict engineering grade color at the price of black and white. For the sake of the industry I hope that this includes bringing up the price of black and white. The pricing for black and white and color doesn't have to be the same for the market to turn change. If it is within a reasonable range I believe you will see major changes occurring. The adoption of BIM (Building Information Modeling) will also drive the demand and applications for color. In a previous life I sold to the discrete manufacturing market (manufacturers of cars, planes, construction equipment, etc.). When 3D CAD became mainstream the demand for color printing increased substantially. 2D CAD produces linework where 3D CAD produces models as color renderings. The default output is color! This will kick start the demand for engineering grade color and I believe other applications will emerge. The opportunity for reprographers is to ride the color wave, but to also become experts in these color applications. There are two significant developments to watch in the AEC reprographics world. The first is affordable engineering grade color and the second is 600 DPI production printers. KIP has captured the curiosity of the market by announcing the coming of the KIP Color 80 and the KIP 9000. Neither of these devices are being shipped today and I am certain that their competition isn't sitting idle. I will expand more on the ramifications of these devices in subsequent posts.